than 100 sq.m. 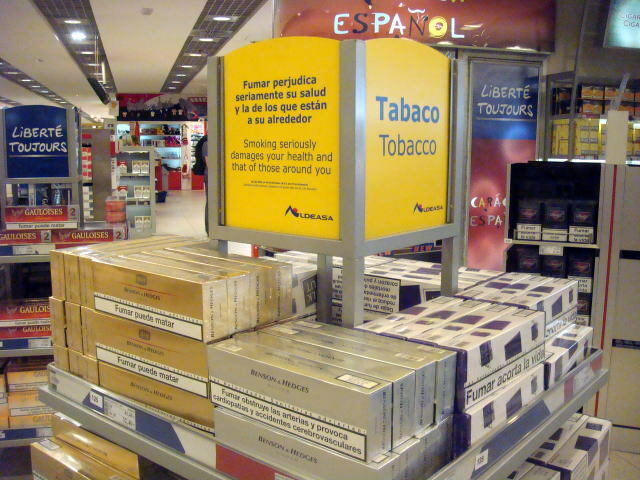 could choose whether to allow or to prohibit smoking. and restaurants for failing to comply with the law. 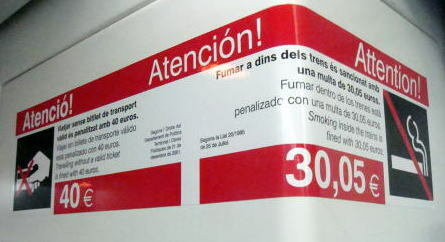 A sign plate shows a fine of 40 and 30.05 Euros for traveling without a valid ticket and smoking inside trains, respectively. 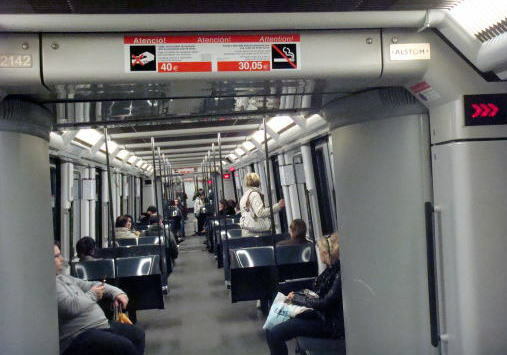 This photograph was taken at a Barocelona subway train in May 2010. 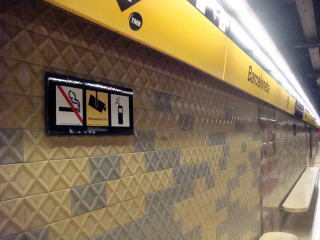 (L)(M) A sign board shows that no-more-smoking beyond this point, at a Barcelona subway station and at Funicular de Montjuic station. 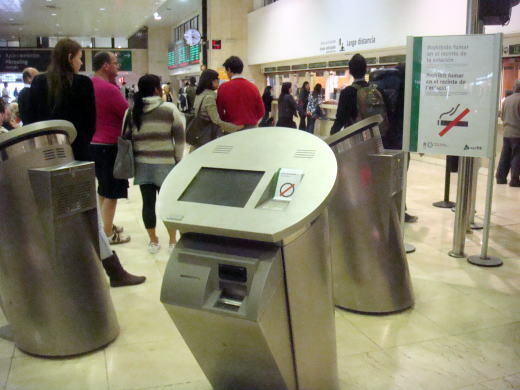 (L) Many people are always smoking near the entrance to the Barcelona Sants railway station. 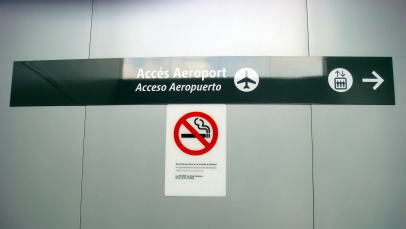 (R) No-smoking sign displayed in the corridor between Renfe Aeroport railway station and Bercelona airport terminals. (R) A small station cafe attached to the railway station. 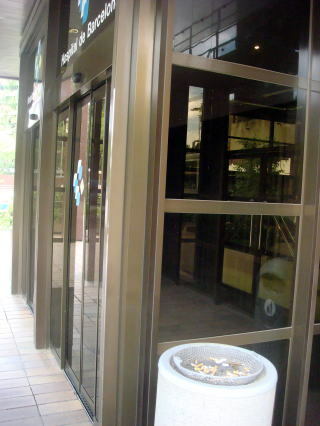 No-smoking sign is displayed at the entrance. 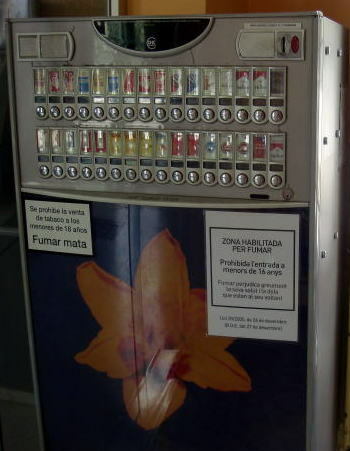 (L) An automatic bending machine for tobacco sale placed in the station cafe at Cornella, Barcelona. 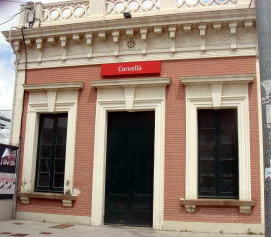 (R) Two are smoking under the stairway to the subway station at Cornella Centre. 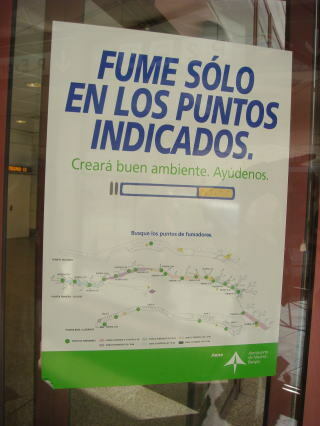 (L) No-smoking sign plate attached near the train window of Renfe, between downtown and airport of Barcelona. 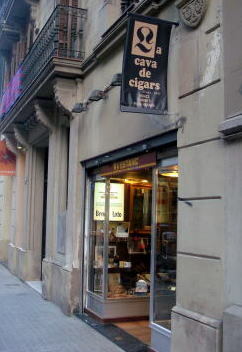 (R) This restaurant-bar in Barcelona provides a smoking space. 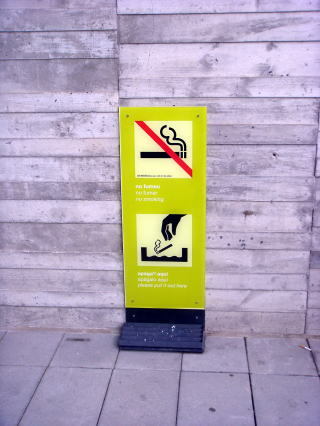 It says that the rest of space, smoking is prohibited. 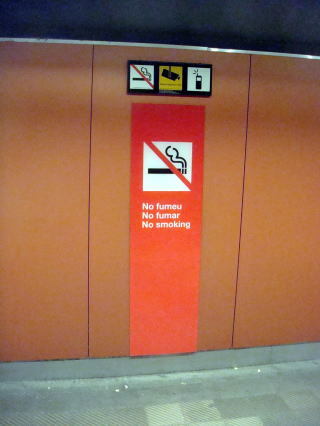 (L) The sign plate shows that smoking is allowed in this space. The sign next may be the meaning of that, please shut the door. 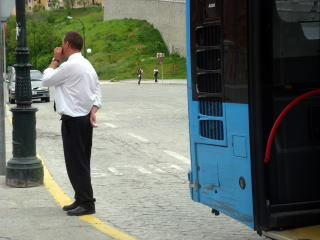 (R) A bus driver was smoking while waiting for the time of departure. 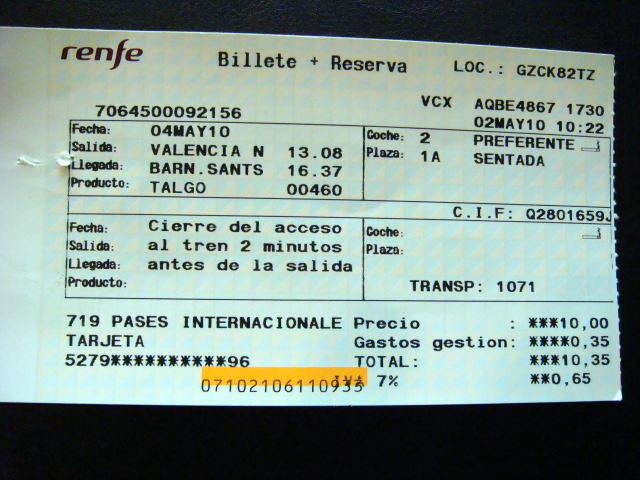 A Renfe reservation ticket issued in May 2010. 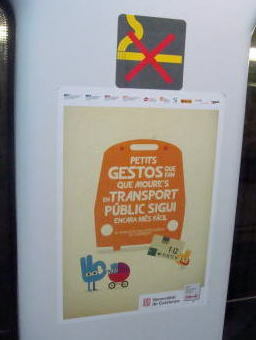 Please note that there is two 'smoking-seat' sign on the ticket. 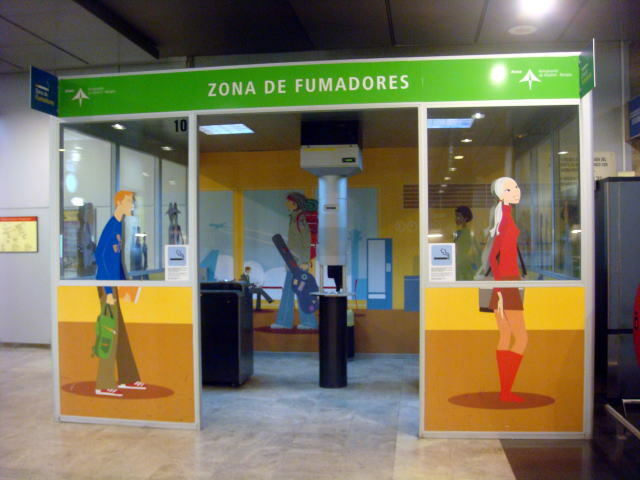 after the law of smoking ban on all Spanish trains came into in force in January 2006! 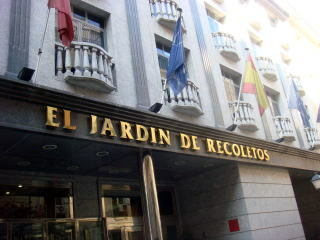 The photographs show the Hospital de Barcelona and an ashtray stand near by the hospital entrance. No smoking restriction is enforced there. 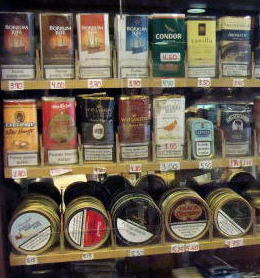 The price of 20 Malboro cigarette is 3.60, Winston 3.15, and Camel 3.30 Euros. 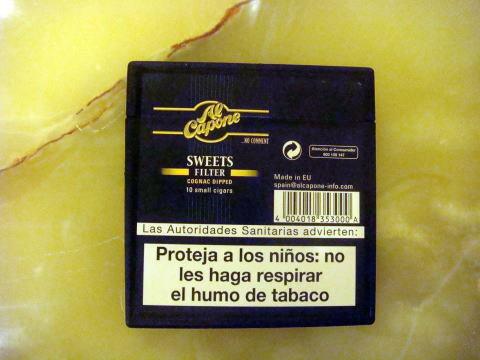 Health warning: (L) Protect children. 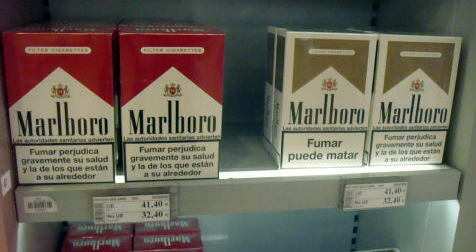 Do not children breathe tobacco-smoke (R) Smoking can kill the human. 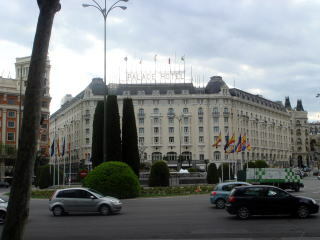 Hilton Madrid Airport Hotel has 284 total guest rooms. 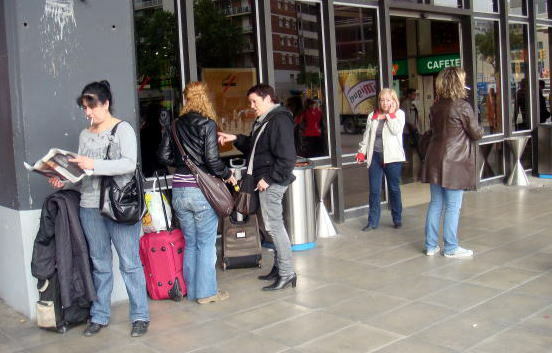 Of these, 49 (17%) are smoking rooms. 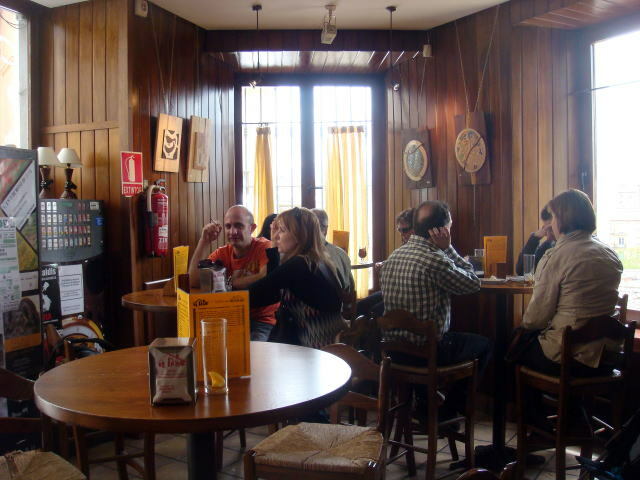 All bars and restaurants are smoke-free. guest rooms. 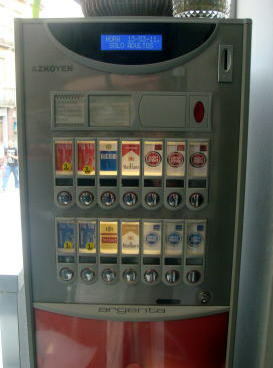 No smoking booth is inside. 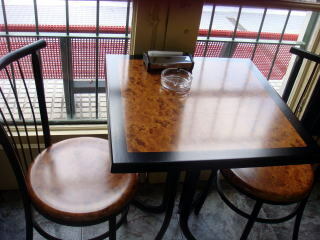 Bars and restaurants are smoke-free. 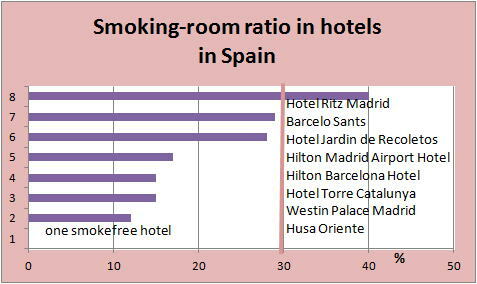 40% are smoking guest rooms. The hotel did not disclose the exact number of smoking rooms. 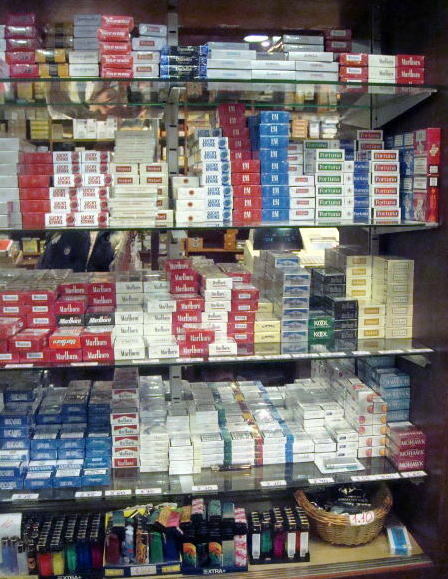 The restaurants of Ritz prohibit smoking, but in bars, smoking is allowed. is 28%. Here, smoking allowed in the bar. 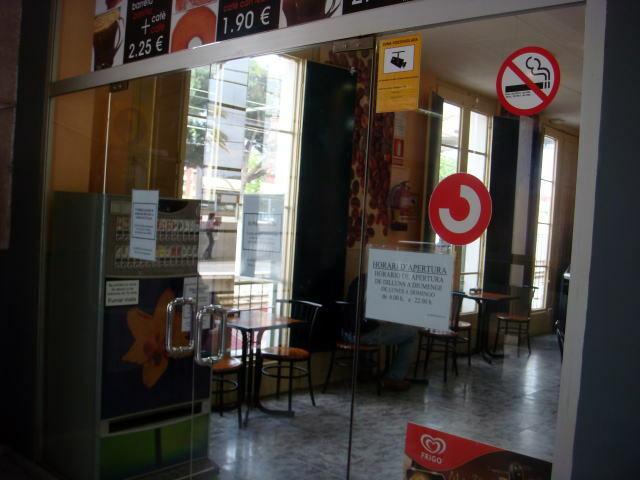 In the restaurant, smoking is prohibited in breakfast. However, it is allowed in lunch and evening meal hours. 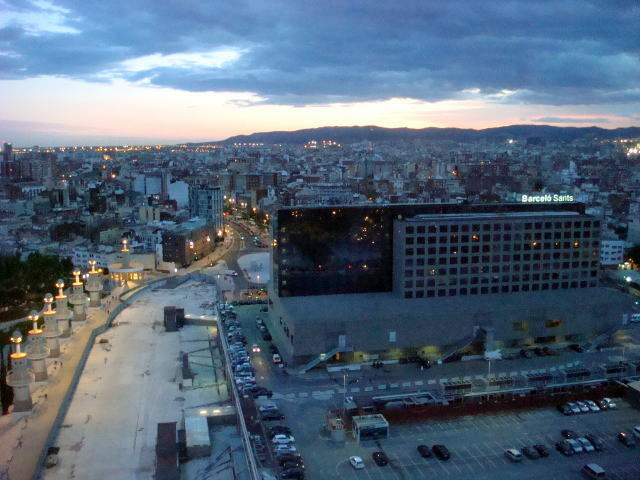 Barcelo Sants, Barcelona has total guest rooms of 377. 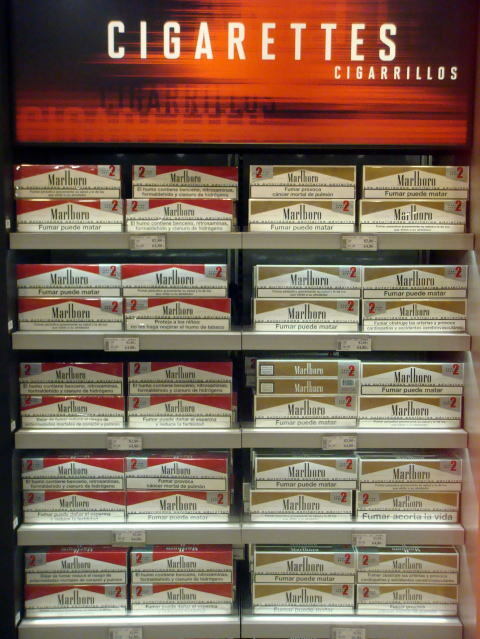 The number of smoking rooms is 108 (29%). Bars and restaurants in this hotel are smoke-free. 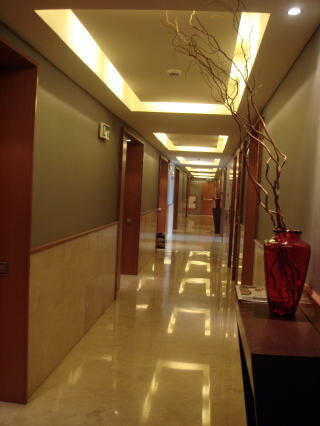 rooms are 41(15%), of the total 272 rooms. 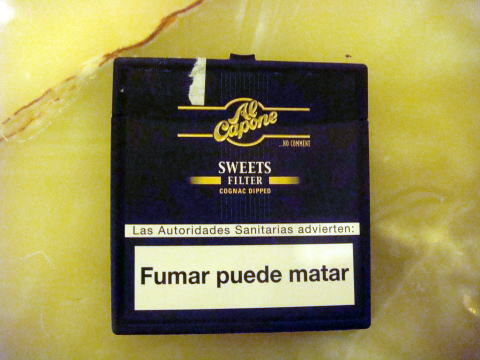 Smoking is banned in a hotel restaurant and bar. smoke-free. The only place to smoke inside is the bar. 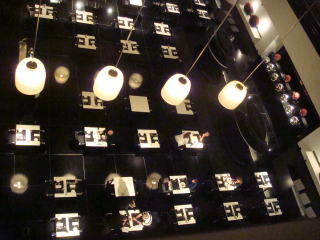 in restaurants and bars in Hilton. 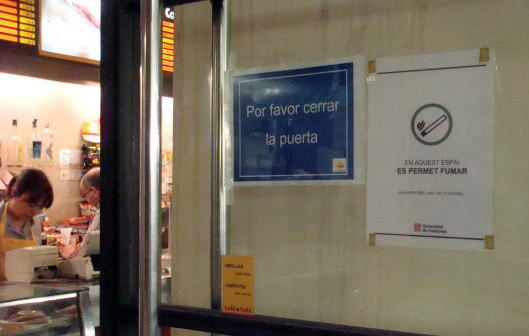 Spain has enforced a total smoking ban in restaurants and bars in January 2011. 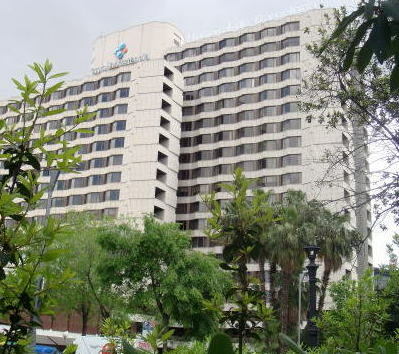 Hotels will be allowed to set aside 30 per cent of rooms for smokers. 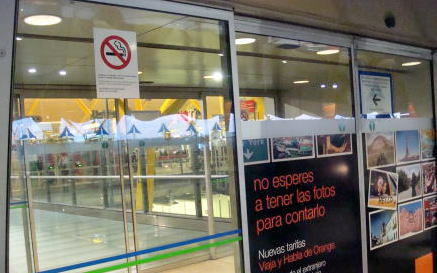 (L) This photo shows the smoking room in the Terminal 1 of Madrid international airport. 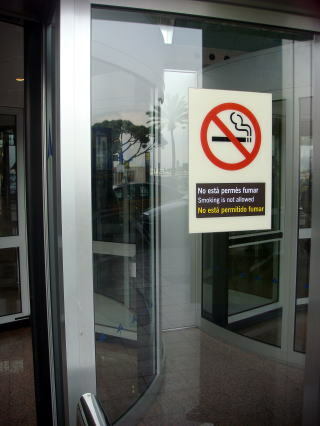 Please note that there is no door in this room and toxic tobacco-smoke may flow out to the space of the airport terminal. formaldehyde ( toxic to human health ). 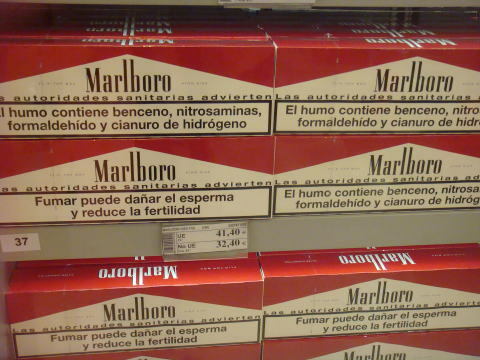 Cigarette may cause sexual impotence ( due to decreased blood flow ) and can be the cause of infertility. 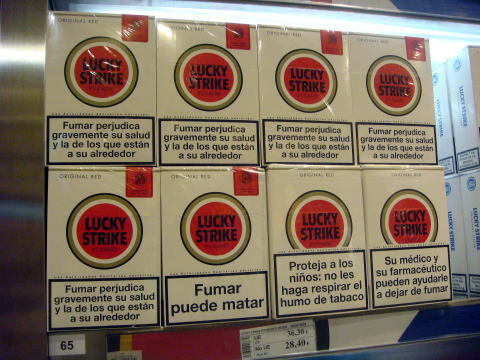 Health warning: Smoking kills. 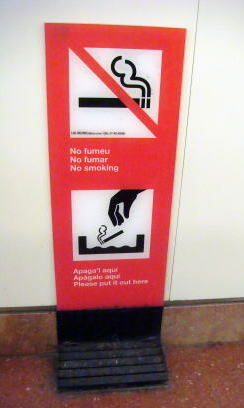 Do not the children to inhale a tobacco-smoke. 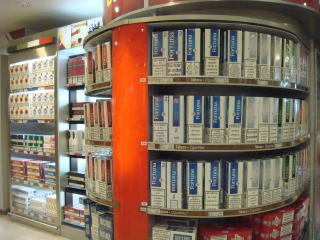 Smoking is determined to be dangerous to your health. 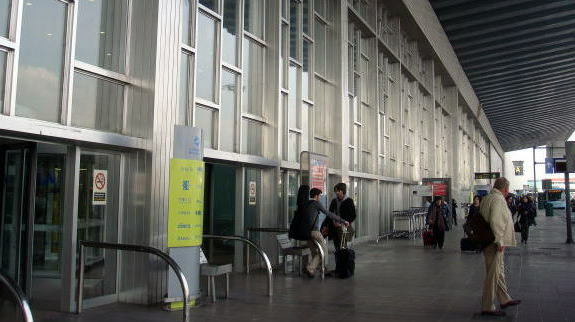 All photographs were taken in May 2010. 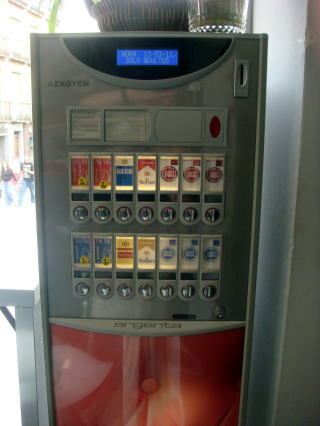 A price of Marlboro is 3.6 Euros at a cafe/bar or at a tobacco shop in Spain. 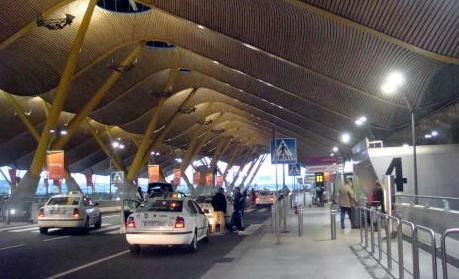 destinations at 41.40 Euros, and for passengers to the non-european destinations at 32.40 Euros. 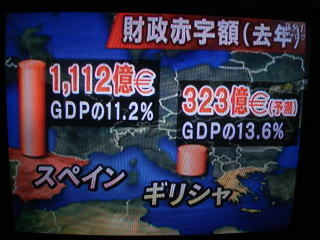 and in Greece it was 323 hundred billion Euros, 13.6% of GDP. 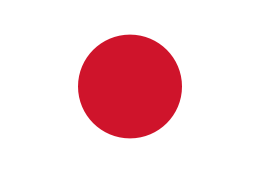 (M) The market is suspicious about the bank asset is decreasing related to the collapsed real estate boom. 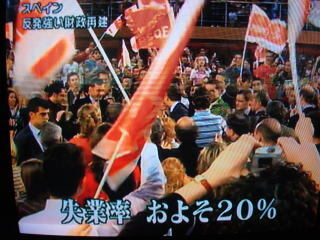 (R) Spain had its unemployment rate near 20 %, with a lot of people lost their jobs. 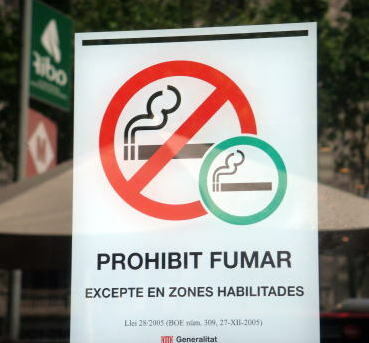 in every indoor public place, including bars, clubs and restaurants before the end of 2010.
possibly affect on the Government's enforcement of the new strict smoking ban. 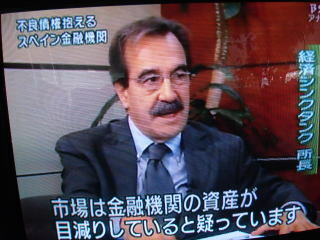 The article was written in June 2010, and last revised in August 2013, by Junhaku Miyamoto, M.D., PhD.